My beloved blog followers, some have expressed concern that the Seal of the Living God, as provided for by God the Father to 7th Messenger, Maria Divine Mercy, is an occult symbol such as a magical pentagram. This concern has been brought to my attention due to a Wikipedia article about some medieval occult symbol which uses the Latin words, sigillum Dei (Aemeth), to describe such an image. Firstly, please understand that Wikipedia is not a very good nor helpful academic reference at all. This is because Wikipedia can be edited by anyone on the internet and can be falsified in many ways by people in the information that it provides to the general public. That is why universities do not allow Wikipedia to be cited as a scholarly reference when students and researchers are writing papers and books. I know what I am talking about. I worked for over 11 years in higher education in faculty affairs and have dealt with many plagiarism and student conduct issues. I also have advanced academic degrees, have been an editor on a legal journal, and worked in a law library. Trust me, Wikipedia should not be your main source for factual information. It is highly inaccurate and unreliable. Secondly, if one looks at the image used for the Seal of the Living God in comparison to the image used in the Wikipedia article, both look totally different from one another. 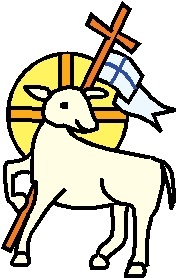 The image used in the Seal of the Living God was personally approved by 7th Messenger, Maria Divine Mercy, after she consulted with Our Lord, Jesus Christ. It features the surrounding Latin words, Sigillum Dei Vivi, and has a Cross encircled by a Crown with Three Jewels for the Most Holy Trinity – Father, Son, and Holy Spirit. This image is in stark contrast to the occult imagery in the symbol provided for in the Wikipedia article. Holmes, M. W. (2011–2013). The Greek New Testament: SBL Edition (Re 7:2). Lexham Press; Society of Biblical Literature. Anyways, I am not a language expert—I just know how to use Google Translate pretty well on the internet and I have pretty sophisticated Bible study software (I did a review on Verbum Catholic Bible Study software about two years ago)—and I have enough knowledge in certain languages to understand linguistic nuances between them, especially, on translation issues. Anyways, I want to reassure people that the Seal of the Living God as provided to 7th Messenger, Maria Divine Mercy, is not some type of occult image violating any commandment of God. In truth, it was personally approved by Our Lord. Also, the Latin words, sigillum Dei vivi, are simply that—Latin for the English words, “Seal of the Living God,” and bear no relationship or connection whatsoever with the sigillum Dei (Aemeth) being promoted in the Wikipedia article. I hope that this commentary is helpful for people. God bless! For the past month or so, I have been studying the Secrets of Fatima and Secret of La Salette. And in particular to La Salette, I wrote a short commentary interpreting specific challenging statements, which God gave me immediate insight to their meanings. (See Special Commentary – Secret of La Salette – “It will rain with a fearful hail of animals” https://maryrefugeofholylove.com/2018/03/06/special-commentary-secret-of-la-salette-it-will-rain-with-a-fearful-hail-of-animals/). Well, this special commentary about the Secret of La Salette will be a little different. Unlike my previous commentary in which God gave me immediate clarity to specific phrases, this writing comes from me discerning and reflecting upon other challenging statements for the past month or so. And because I do not claim perfect discernment, my interpretations are subject to human flaws. Nonetheless, I am going to attempt to interpret these specific words of Our Lady in hopes that people will gain fruit from my discernment—trusting that everything will be reconciled by Our Lord in the end. And so, I hope that people will be blessed by this writing. First, I will share the excerpts of the Secret of La Salette that I will be discerning. Then, my interpretations will follow on the particular phrases for your consideration. God bless! I believe that these two statements by Our Lady of La Salette have two interpretative meanings. The first meaning is in regards to what we are currently witnessing in our societies and communities; and the second meaning is in regards to what will happen during the Great Apostasy of the Catholic Church. First, the meaning for today. I, a soul, am an American, so I will speak about what I am witnessing in my country. However, I know that similar things are taking place elsewhere in the world such as Europe, Africa, Latin America, etc., so people from other countries can relate. Currently, we can see this prophecy happening, particularly, in the growing public acceptance of witchcraft and even, satanism, in America. This also extends to practitioners of the occult and the New Age—all of which encourage worship of nature and the natural world. And as churches close due to lack of attendance and funds, these buildings are being sold off to practitioners of these pseudo-religions, which is an utter tragedy for these places once consecrated to worship of the True God, Our Heavenly Father and His Divine Son, Our Lord, Jesus Christ. Now, I am not an expect in the tactics of the occult. However, Our Lord has given much help through heavenly messages about the growing fact of trafficking witches in America, Africa, and elsewhere (See heavenly messages given through the Apostolate of the Green Scapular, http://www.greenscapular.org). And I know that this phenomenon is not limited to witchcraft, but is wide-spread in all pseudo-religions like satanism and New Age. Called “astral projection,” this phenomenon is even promoted in yoga—a form of Hinduism, when people delve into the belief systems behind such practices. Trust me, I know, because before my conversion to Catholicism, I studied books on advanced yoga, trying to figure out what was the true faith on earth. So, I am going to tell everyone that reads this special commentary, if you practice yoga, please stop. Not only are you glorifying demons through animal poses, you are physically practicing a belief system that is contrary to Christianity. Yoga is not simply a benign exercise, etc.—it is contrary to Christian faith. So, please think about what you are doing. Now, the second meaning for these two statements by Our Lady of La Salette, holds also true for what will happen under the Great Apostasy of the Catholic Church. Under the leadership of the antichrist and the false prophet, satan seeks to change the Catholic Mass making it satanic worship. Thus, Catholic churches will become dens for the satanic mass. In the Book of Truth given to 7th Messenger, Maria Divine Mercy, Our Lord, Jesus Christ, has revealed that through a wide-spread nuclear war, the antichrist will rise to worldwide prominence and power, by being the peace-maker among all warring nations. And so, through these acts, the antichrist will endear himself among all peoples, which will give him entry to seize leadership of the Catholic Church, through the invitation of the false prophet. And when this fact was revealed by Jesus, I will be honest and say, I wondered to myself, why does satan want to stop the nuclear war? It did not make sense to me, because I thought to myself, surely, satan can inflict much lasting devastating damage on the human race with millions dying around the world due to the wide-spread use of nuclear weapons(?). Truly, why does satan want to stop the nuclear world war? I was puzzled until I finally saw the video that I wrote much about in my Armageddon commentary. Then, I realized the reason why, which is hinted about in the Book of Truth given to Maria Divine Mercy. The fact is, satan’s Armageddon—his demonic alien war—is much more cataclysmal and ruinous to the human race. That is why satan will have the antichrist stop the nuclear war. Because he has something much more devastating planned with his demonic alien war. Hence, Our Lady said in one message in Locutions To The World, that if satan were allowed by Our Heavenly Father to do everything that he has planned, there would be nothing left. However, satan cannot stage his demonic alien war (Armageddon) yet, because he does not have enough demonic power. Thus, he needs to remove the protecting power of the Most Holy Eucharist (Abomination of Desolation) in the Catholic Church, and have worldwide worship through the satanic mass. 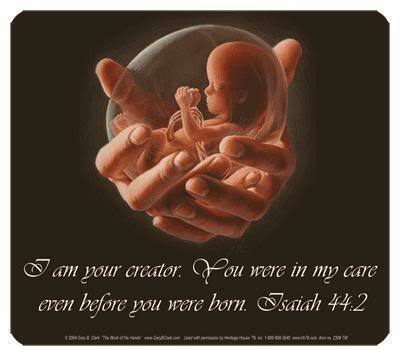 Only in that way, satan can kill off the entire human race, thus, ruining the Divine Plan of Our Heavenly Father. Nothing else will satisfy him. 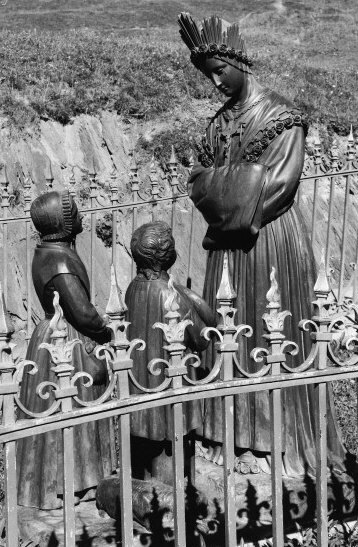 Now, Our Lady desires that I make a connection between the Secrets of La Salette and Fatima, which I did not make in my earlier writing (See Special Commentary – “Secret of La Salette – “It will rain with a fearful hail of animals” https://maryrefugeofholylove.com/2018/03/06/special-commentary-secret-of-la-salette-it-will-rain-with-a-fearful-hail-of-animals/). In my prior writing, I revealed that the statement by Our Lady of La Salette, “it will rain with a fearful hail of animals,” refers to demons disguised as aliens. Now, some may contend that it does not refer to alien demons, but to actual animals, such as falling flocks of birds, which some people have witnessed in places, etc. Now, Heaven desires that I make the connection between the First and Second Woes of Revelation (Fifth and Sixth Trumpets), Chapter 9, with the demonic alien war planned by satan. (Please see the References at the end of this special commentary for the text of Chapter 9 of the Book of Revelation). This First Woe comes after the First Four Trumpets which describe the potential nuclear war. The First Woe describes the demonic locusts that attack the evil people who do not have the Seal of the Living God on them. (See The Seal Of The Living God, https://maryrefugeofholylove.com/the-seal-of-the-living-god/) The locusts are allowed to harm people for five months but not kill them. They are described as coming from hell and look like horses for battle with human faces and lion’s teeth. Also, part of the Second Woe (Sixth Trumpet) includes a horrific description of 4 devils, along with a cavalry of 200 million soulless demonic beasts, being released to kill 1/3 of the human race on earth. These demonic beasts are described with having great power in their mouths and in their serpent tails. I believe that these demonic beasts will be the ones who will be able to kill by the method I mentioned in my Armageddon writing and as mentioned on the video. The “star that had fallen from the sky to the earth” refers to a fallen priest in the Catholic Church. In particular, it is a reference to the anti-pope, the false prophet, who enables satan’s demonic alien war to happen by granting demonic power to satan through the Abomination of Desolation and worldwide worship in the satanic mass. This becomes possible when the antichrist is invited by the false prophet to take up reign in the fallen visible Catholic Church. Finally, in respects to the Secret of La Salette, I believe that the mention of people being transported by evil spirits, including priests, also refers to alien (UFO) abductions, which will become more frequent as satan gains more demonic power through worldwide worship in the satanic mass. Already, we see more mainstream mention of people spotting and video-recording alien/UFO sightings around the world. This is directly related to satan gaining more demonic power through the mainstreaming of pseudo-religions as mentioned before. And once the Catholic churches adopt the satanic mass, such manifestations will become even more common, even among the fallen clergy—all in keeping with satan’s diabolical plan for the End Times. Meanwhile, much has happened in the 180 years or so since the Secret of La Salette was given by Our Lady to seer, Melanie. And when Melanie wrote it fully down shortly before her death at the turn of the century, she included her explanations of what she thought Our Lady was referring to (as indicated in the parentheses and in the footnote). Thus, we must be aware that Melanie’s interpretations might be humanly flawed, especially colored with a 19th century frame of reference. Now, as I said before, I do not claim perfect discernment. However, I want to attempt to interpret this challenging statement by Our Lady of La Salette, hoping that my readers will give me the benefit of the doubt. And, of course, I will be discerning with a 21st century frame of reference, the current world situation as we are on the cusp of the Great Tribulation of the Apocalypse. Well, I believe that these words of Our Lady of La Salette are referring to the phenomenon of near-death experiences, which sometimes occurs when people have been saved by medical technology after a brief time of clinical death. In particular, these people will sometimes mention either a heaven or hell experience, which often radically, changes their lives and perceptions of the afterlife. Now, I am going to make a claim that people are free to disagree with, but personally, I believe that any near-death experience that does not bring a person closer to Our Lord, Jesus Christ, in Christianity, is false and from lucifer. Also, I am going to claim that many experiences that people have of Heaven are also false, if it does not bring a person closer to Traditional Christianity. And so, based on my personal experience, I am skeptical of many near-death accounts. Even ones that speak of Heaven, because I know from studying heavenly messages through the years, that it is actually difficult to enter Heaven right away upon death. Even if a person is following the Ten Commandments as they should be, one venial (lesser) sin will send a person to Purgatory. Truly, at death, a person has to have such a deep trust in God saving him that his love for God has to be so strong that it overcomes any semblance of self-love. That is actually really hard to do without have a strong Christian faith already. It is not impossible, but I recognize that it is difficult for most. Also, Heaven has recently revealed to me that at the time of the Great Warning (Illumination of Conscience) happens, 90% of the world population is going to see hell as their eternal judgment, if they continue the same path that they are walking on. Then, the rest will see deep Purgatory and a very small percentage will see Heaven. And so, knowing the percentages currently involved, it is hard for me to understand why there are so many near-death Heaven accounts today, and hardly, any mention of Purgatory, etc. I am not casting judgment on any particular person’s account, as I know that many people are being sincere about their experiences in the afterlife. However, I think that a lot of people do not realize how involved lucifer is, especially, at the moment of death, which is the greatest battle for every soul’s salvation. The moment of death should never be taken for granted and always be well-prepared for. Otherwise, there is the extreme jeopardy of losing one’s soul, or being saved but spending much time in deep Purgatory. I mean, even Sister Faustina of Divine Mercy, had an experience recorded in her diary, I believe, where she realized that she would spend 2 days in Purgatory for a few venial sins… And she was a living Saint! So, I do not pass judgment on anyone’s sincerity about their near-death experiences. I just believe that many of the situations are being manipulated by satan, especially, if there is no mention of Purgatory, or they do not lead to a deeper faith in Traditional Christianity or the Catholic faith, etc. Also, I need to make a comment about something that I found on YouTube about two months ago. I realized that there are many accounts of people having visions of Heaven and hell on YouTube. In fact, it is on YouTube that I found 10-year old Jeremy’s near-death experience, retold by his mother, which I used as my basis for my Armageddon commentary. So, I do believe that there are genuine accounts of the afterlife available, but most of the visions that people are having about celebrities and relatives in either Heaven or hell, I find to be false—although I know people are being sincere about seeing something supernatural. I just believe that most visions are being manipulated by satan, especially, if they lead away from Traditional Christianity or the Catholic faith. Now, I will tell you why. In my life, I have had two experiences where lucifer approached me disguised once as a soul from Purgatory and once as a soul in Heaven. Both times, lucifer disguised himself as people that I knew during my lifetime (in particular, my grandfather and a close friend). But, thanks be to God, I discerned both times that it was satan and was saved from certain death (I love my guardian angel, St. Michael the Archangel, and St. Joseph). And so, I share these things, because I want people to understand that it is Very Easy for lucifer or any devil to appear as a deceased person that one knew in life during a vision or supernatural visitation. It is Really Easy to do, especially, if it is the same devil who was assigned by lucifer to tempt that person throughout their life on earth. That devil intimately knows everything about the deceased person, and it is Very Easy to manipulate the “energy pattern” of that person for a vision or supernatural visitation. So, such occurrences always need to be properly tested and discerned before someone readily accepts that the person is truly whom they say that they are. And unfortunately, I did not see that happening or ever being mentioned in the few YouTube videos that I watched. Perhaps, that is because the vast majority of them were created by Protestant Christians that do not have the traditional counsel of a spiritual director/priest, such as in the Catholic Church, to help in discernment and testing of spirits. So, do not be deceived by the many YouTube videos that speak about near-death experiences and visions of Heaven and hell, particularly, if they give names of people, including relatives and celebrities and their eternal judgment in the afterlife. The fact is, in most legitimate accounts and visions, God usually forbids people from revealing who they see in hell, out of respect for the families who are still living on earth. Also, the same “forbidden rule” applies to lucifer and his devils most of the time. Personally, that was one of the reasons that I was able to discern that my close friend, whom I knew was in Heaven, was in fact, lucifer in disguise. As I shared in my Memoir, my “friend” was trying to talk to me about her previous sins, but it did not make sense to me, because I knew that she was finally out of Purgatory and in Heaven, and that God had forgiven and forgotten all her sins. Yet, my “friend” kept trying to suggest what her sins were even though she could not come out and say exactly what they were. It was a very odd and troubling conversation, but thanks be to God, I figured out it was lucifer and did not get physically harmed. So, I am being very honest and saying that satan is very active in the world today. Not just in everyday secular affairs on the news, but in the very heart of Christian churches and Christian lives. Everything has to be tested and discerned, especially, in matters of the afterlife. Everything that draws a person away from Traditional Christianity and the Catholic Church needs to be rejected. And when I refer to Traditional Christianity, I mean keeping obedience to the Gospel, the Ten Commandments, Holy Love, etc. People really need to protect themselves with sacramentals, devotions, a strong prayer-life, etc., because there is so much darkness right now, and most people do not understand the spiritual warfare that is taking place every moment in their lives. Myself, I am not perfect, but I do see the war that is being waged in my life every present moment. All because I listen to the words of Our Lord and Our Lady at Holy Love Ministries (http://www.holylove.org), answering the call to my own personal holiness. It takes much effort and dedicated work to constantly bring yourself into the present moment battle, but once you recognize your enemy, you can defeat him by grace. All Glory to God. But, all Christians need to fight for their faith. It all begins with making good Confessions and adhering to the Ten Commandments. If you cannot do that, the battle is already lost. Finally, I am going to make a very controversial claim, which is in keeping with the Secret of La Salette and a recent heavenly message. God the Father revealed that “there are people walking the face of the earth without souls and these are satan’s soldiers and army.” However, Our Heavenly Father did not indicate how exactly these people were being brought into existence on earth. But, I want to make claim, even though I do not have any evidence of it, nor am I passing judgment on any person. But, I want to say that it would not surprise me if some of the people who are being brought back into life after being declared clinically dead are no longer human. I have no evidence, because this is not something that I study, but it would not surprise me if devils were taking advantage of modern medical technology and assuming physical control of deceased bodies after their souls have left at the moment of death. (See heavenly message, God the Father – “There are people walking the face of the earth without souls and these are satan’s soldiers and army” https://maryrefugeofholylove.com/2018/01/06/god-the-father-there-are-people-walking-the-face-of-the-earth-without-souls-and-these-are-satans-soldiers-and-army/). Again, I know that is a shocking claim to make and I have no hard evidence. I also do not want to scare people, especially, if they have relatives or friends who were saved from death due to medical advances, etc. But, I say it, because I have battled satan much, experiencing his heightened supernatural powers many times. And so, it would not surprise me the least bit, if lucifer and his devils could actually do such a feat, especially, due to modern medical technology. Especially, since I have written, based on personal experience, that demonic possession takes place within the physical body and not the spiritual soul. So, I could see it happening, especially, as it is suggested by Melanie in her explanations of the words of Our Lady in the Secret of La Salette. Anyways, I do not want to conclude this special commentary with such a sensational claim. Rather, I want to end this writing with a great deal of hope. Half the battle is just simply being knowledgeable about such things—potential or otherwise, in the supernatural world. The fact is, the more spiritual education one has, the better equipped a person can be as a Soldier of Christ. I do not claim to be an expert in all supernatural matters, but what little I know, I pass along to you all, as my beloved readers, whom I love and care about very much. Our Lord and Our Lady have blessed me so much, and I am so grateful and desire very much to share these blessings with everyone, so that together, we can be united as one loving Body in Christ. So, I offer this special commentary to you all for your own fruitful discernment. Please, take from it, whatever can be useful to you, and know, I am not perfect in my own discernment, but all that really matters in the end, is charity and love. I offer you everything with charity in my heart and hope that you receive what you can in love. May God bless each of you ever-abundantly. I love you all. The Fifth Trumpet. 1 Then the fifth angel blew his trumpet, and I saw a star that had fallen from the sky to the earth. It was given the key for the passage to the abyss. 2 It opened the passage to the abyss, and smoke came up out of the passage like smoke from a huge furnace. The sun and the air were darkened by the smoke from the passage. 3 Locusts came out of the smoke onto the land, and they were given the same power as scorpions of the earth. 4 They were told not to harm the grass of the earth or any plant or any tree, but only those people who did not have the seal of God on their foreheads. 5 They were not allowed to kill them but only to torment them for five months; the torment they inflicted was like that of a scorpion when it stings a person. 6 During that time these people will seek death but will not find it, and they will long to die but death will escape them. 7 The appearance of the locusts was like that of horses ready for battle. On their heads they wore what looked like crowns of gold; their faces were like human faces, 8 and they had hair like women’s hair. Their teeth were like lions’ teeth, 9 and they had chests like iron breastplates. The sound of their wings was like the sound of many horse-drawn chariots racing into battle. 10 They had tails like scorpions, with stingers; with their tails they had power to harm people for five months. 11 They had as their king the angel of the abyss, whose name in Hebrew is Abaddon and in Greek Apollyon. 12 The first woe has passed, but there are two more to come. The Sixth Trumpet. 13 Then the sixth angel blew his trumpet, and I heard a voice coming from the [four] horns of the gold altar before God, 14 telling the sixth angel who held the trumpet, “Release the four angels who are bound at the banks of the great river Euphrates.” 15 So the four angels were released, who were prepared for this hour, day, month, and year to kill a third of the human race. 16 The number of cavalry troops was two hundred million; I heard their number. 17 Now in my vision this is how I saw the horses and their riders. They wore red, blue, and yellow breastplates, and the horses’ heads were like heads of lions, and out of their mouths came fire, smoke, and sulfur. 18 By these three plagues of fire, smoke, and sulfur that came out of their mouths a third of the human race was killed. 19 For the power of the horses is in their mouths and in their tails; for their tails are like snakes, with heads that inflict harm. 20 The rest of the human race, who were not killed by these plagues, did not repent of the works of their hands, to give up the worship of demons and idols made from gold, silver, bronze, stone, and wood, which cannot see or hear or walk. 21 Nor did they repent of their murders, their magic potions, their unchastity, or their robberies. I have been reflecting a lot on these words, as I have written much lately about the possible realities for mankind’s future and Our Father has been speaking a lot lately about how to prepare our hearts for the future, for whatever may happen. In September 2017, I wrote a special commentary called, “Prayers for Creating A Refuge and Self-Protection” (https://maryrefugeofholylove.com/2017/09/26/special-commentary-prayers-for-creating-a-refuge-and-self-protection-by-a-soul/), which I suggest that everyone read. This special commentary is a continuation of the thoughts of that commentary, which I hope will also be helpful for many people. In particular, I am doing this writing to help people protect their homes, property, and families, from nuclear attack. Because only God knows the future, but there are things that we can do to help ourselves to prepare for whatever might come. The fact is, Our Father has said that while He cannot change the free-will choices that people make, He can mitigate and change the resulting consequences, circumstances, and effects of those choices. 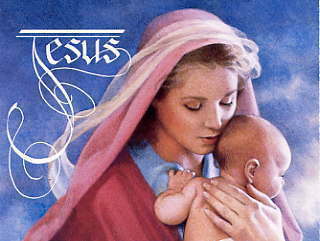 While reflecting upon these words, I recalled a posting that I did in December 2016 (See: Part Three – The Only Solution More Powerful Than A Nuclear Weapon – Our Lady of Fatima, https://maryrefugeofholylove.com/2016/12/05/part-three-the-only-solution-more-powerful-than-a-nuclear-weapon-our-lady-of-fatima/), which was about a group of German monks who were devoted to Our Lady of Fatima and miraculously survived being at the hypocenter of the nuclear bomb dropped at Hiroshima, Japan, during World War II. Both their monastery and themselves were miraculously preserved by Our Lady. The monks suffered no ill-effects from the resulting radiation and all of them lived long, healthy lives. This miracle is well-recorded in history with the monks undergoing many medical and scientific tests over the years by the Japanese, German, and American governments, etc. In my post, I include two short videos with the monks speaking about the miracle. On that day of August 6, 1945, Our Father could not change the free-will choice of Our President and the American government to drop the nuclear bomb on Hiroshima. But, what Our Father could do was mitigate the circumstances and effects for those who believed and trusted in Him. And that is what Our Heavenly Father did for His children, the monks who survived. It did not matter that they were “German”—the enemies of the Axis government of Adolf Hitler, who was slaughtering His children, the Jews. In that moment, Our Father saw the monks as His children, too, and I believe, because they were Christians, that these special men of God were doing their best to spread the message of love for God, despite the terrible times and government they were under. Only God can truly judge men’s hearts, but I mention this fact, because in a nuclear war, no one wins—no one can claim that they are truly the “good ones” with a “righteous” reason for dropping a nuclear bomb. Sometimes, our leaders can choose to do things that are not good, but thankfully, we are not judged by what our leaders do or think, but individually, as who are in our hearts—good or bad—before God. And so, in my September commentary, I wrote of three ways to protect our homes, particularly, if we are interested in having our properties become a refuge during the Great Tribulation. They are: 1) keep a blessed Seal of The Living God displayed in our homes (Book of Truth – Maria Divine Mercy); 2) have our properties blessed by a priest using the refuge protection prayers given to Prophet John Leary (http://www.johnleary.com); and 3) to pray and place four canisters of blessed objects on the four corners of our property (according to instructions given to visionary, Anna Maria of the Apostolate of the Green Scapular, http://www.greenscapular.org). Now, let’s be honest here. 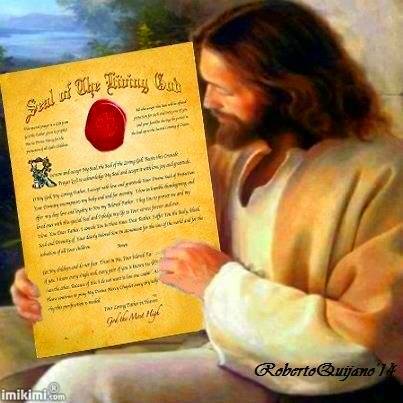 For most of us, it is going to be hard to have a Seal of the Living God blessed by a priest, because most priests do not believe in the Book of Truth and they have misgivings about 7th messenger, Maria Divine Mercy. Also, it is going to be even harder to find a priest to bless our homes according to the prayers given to Prophet John Leary, because most priests do not believe we are living in the End Times and have no interest in helping to create a refuge. Also, for many of us, maybe we do not want our homes to be a refuge for the entire time of the Great Tribulation—it is certainly a lot of work and not everyone has the abilities to lead such an endeavor, etc. However, I do recognize that many of us want to protect our homes and families until the time we are called to the refuges. And certainly, if a nuclear attack happens, we want our homes and families to be protected. So, in this special commentary, I am going to share with you additional things that you can do to prepare for whatever may happen in the future. These are things that you can do even if you do not have a priest that believes in the Book of Truth (Maria Divine Mercy) or in refuges, etc. Firstly, recognize that even though you may not be able to get a Seal of The Living God blessed by a priest, God will still honor the blessings if you display it in your home. 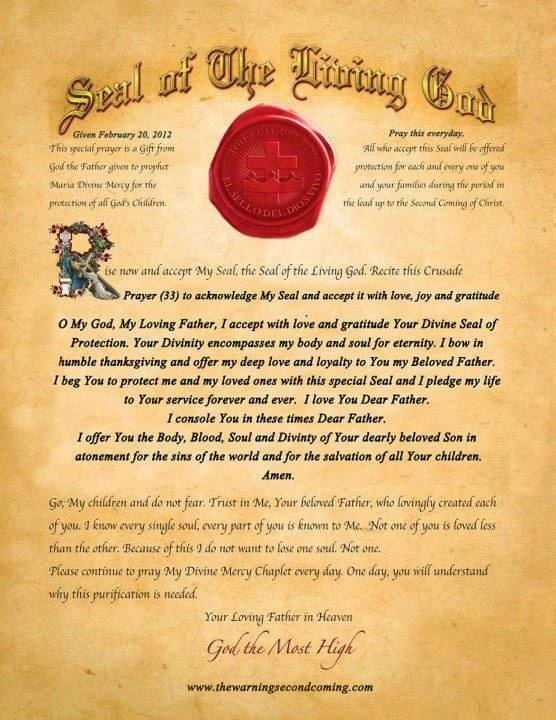 The Seal of The Living God protects both property, body, and soul. Unlike the Brown Scapular of Our Lady of Mount Carmel which only protects the soul, keeping the Seal of The Living God on your body—physical person—will protect you from all physical harm during the Great Tribulation. So, I highly recommend that you keep the prayer on your physical body, either on a business card in your wallet, or you can purchase a Scapular of the Seal of The Living God to wear from Christogifts (https://www.christogifts.com/en/). These items should be easier to get blessed after The Great Warning. I also suggest that people who have the resources to create business cards with the prayer of the Seal of The Living God on them. That way, you have many cards to give your family, friends, neighbors, church, etc. You could be the source of blessings for many people. Secondly, for those who have the resources, I suggest that you create the four canisters of blessed objects that I write about in my September commentary and place them on your property. It will be easier for you to have these objects blessed, because the items are not controversial (for example, they consist of a St. Michael medal, Miraculous Medal, etc.). Please note, one of the things that should be in the canisters are pieces of blessed palm leaves from Palm Sunday. So, if you need this item, please remember to save your palm leaves this coming Lent. Also, for a small donation, the prepared canisters are available through the bookstore of the Apostolate of the Green Scapular (https://greenscapular.org/web_folder/Bookstore.html). Next, I want to mention at this point, that there is no limit to the number of blessings that can be given a home, property, or person. Except in the rare instance that a person should only receive the Most Holy Eucharist once a day (and even that is not an absolute rule, as you can receive the Holy Eucharist at Saturday morning Mass then at Sunday vigil Mass later that day, or in danger of death), a person can be blessed multiple, countless times. I remember reading of one holy Saint who would receive “spiritual Communion” a hundred times a day as part of her prayer to the Lord. Just thinking about this Saint’s devotion amazes me, because she considered her daily reception of the Most Holy Eucharist to be her “gold” and the “spiritual Communions” to be her “silver” coins in Heaven. And I truly believe this Saint must have the hugest pile of treasure in Heaven—I cannot even imagine it! Recently, I wrote in my commentary, “Yes, the Holiness (Faith) of a Priest Counts” (See: https://maryrefugeofholylove.com/2018/01/12/commentary-yes-the-holiness-faith-of-a-priest-counts-by-a-soul/), that any priest that limits blessings on items is doing a disservice to his flock. The fact is to limit blessings on an object or person is to limit the generosity of God! I have holy oil that has over 55 priestly blessings. It has been blessed by popes, it has been blessed by exorcists, etc. Did any of those popes or exorcists or holy priests say, oh, no, I cannot bless this holy oil, it has already been blessed? No! And so, today, I am blessed to have this holy oil that I am afraid to use, because it is so holy—I am partially joking, but I know some people can relate—perhaps, they have a relic or a blessed item that is so precious to them, they keep it hidden in a special place, afraid to use it—it is so holy! (Yes, that is me, a soul!). And so, if you can do all my suggestions—wonderful! And if you can only do one—wonderful! Whatever you do, be happy to be blessed by God! Now, besides my three earlier suggestions in my September commentary, here are my two additional suggestions to especially protect yourself, your family, and your home from a nuclear attack (or even natural disaster). You may find these suggestions easier to do given your circumstances and resources, etc. (See article source: Mailbag: How I invoked Divine Mercy During Hawaii Scare, http://spiritdaily.org/blog/news/mailbag-how-i-invoked-divine-mercy-during-hawaii-scare). And my second suggestion is to do the “Family Consecration To The United Hearts.” Basically, it is a short prayer ceremony in which you gather your family together, read a few short scripture passages and say a family consecration prayer to God and Our Lady. 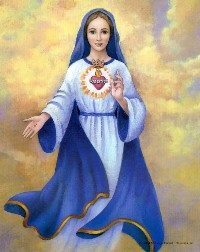 Then, you display Images of the United Hearts and Mary, Refuge of Holy Love, in your home (the images do not need to be blessed). This Family Consecration will act the same as the Lamb’s Blood did for the Israelites protecting them from the Ten Plagues in ancient Egypt. The Family Consecration will protect families and homes from evil. More information can be found on this blog page. Also, if you download the Consecration Prayers, it includes the Images of the United Hearts and Mary, Refuge of Holy Love, for those who need a copy to print out. 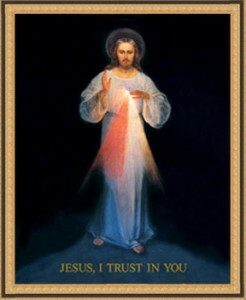 Now, if you decide to do both the Divine Mercy Image and the Family Consecration to the United Hearts in order to protect your family and your home, I think that a wonderful way to approach it, is to first do the 9-Day Divine Mercy Novena in preparation for the Consecration ceremony. Then, as part of the Family Consecration, to also recite the Divine Mercy Chaplet together, and to display the three Holy Images together in your home. For those who also want to do the blessed canisters, remember that you will need the blessed palm leaves from Palm Sunday as part of the items. I think that it would be wonderful if many people this Easter season, made this part of a special celebration for Divine Mercy Sunday. God and Our Lady would be truly honored by such acts of devotion. So many blessings! In conclusion, I pray as always that many people are blessed by my words and that I am helpful. God bless each of you, your families, and your loved ones.